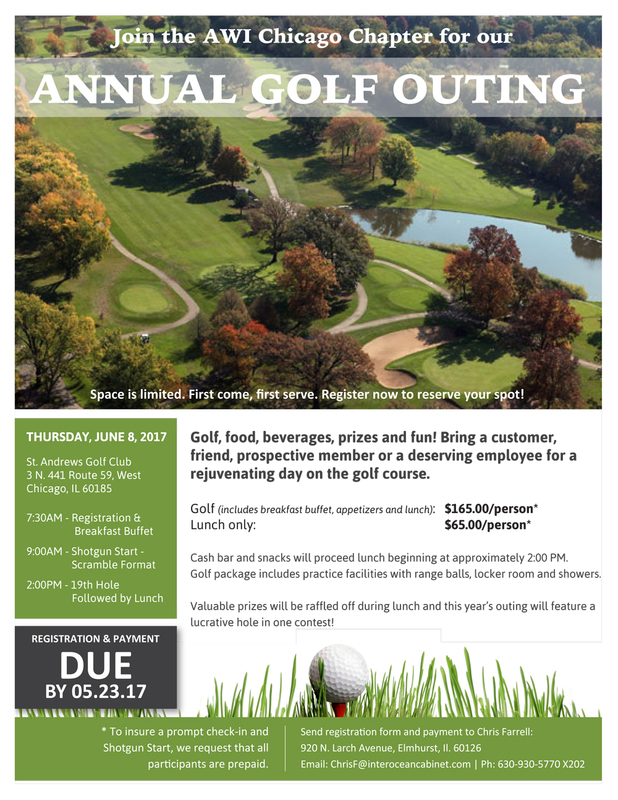 Join us for the annual AWI Chicago Chapter Golf outing! Network with fellow chapter members while enjoying a day filled with golf, food, beverages, prizes and fun! Bring a customer, friend or deserving employees for a rejuvenating day on the golf course! DATE TBD - More info coming soon! 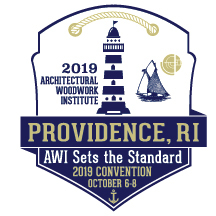 Save the date for the 67th Annual AWI National Convention! Registration has been closed for this event. Join us next year! 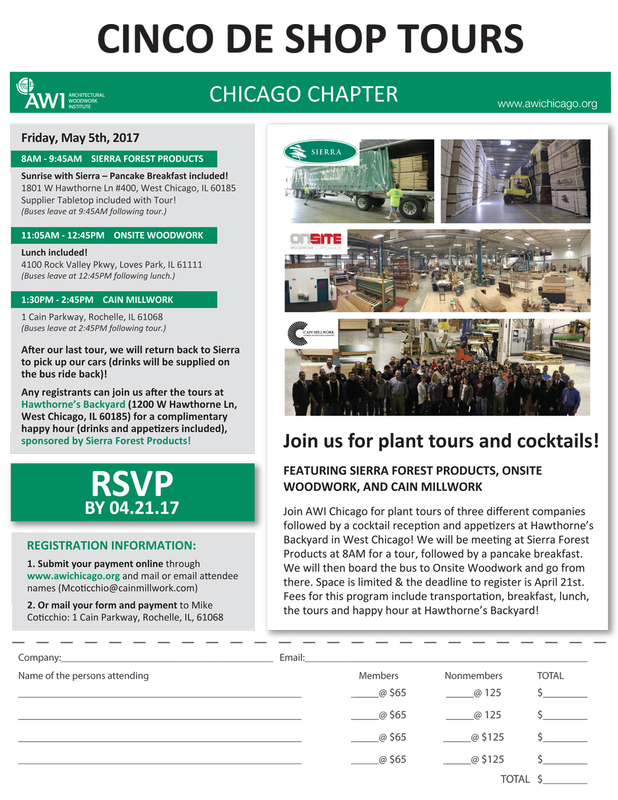 Join us for plant tours and cocktails! 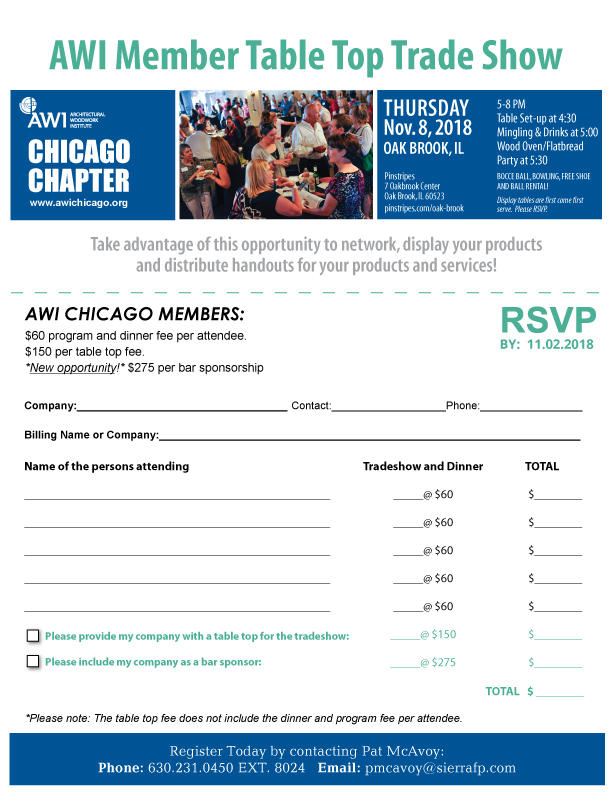 Join AWI Chicago for plant tours of 3 different companies followed by a cocktail reception and appetizers at Hawthorne's Backyard in West Chicago! We will be meeting at Sierra Forest Products at 8AM for a tour, followed by a pancake breakfast. We will then board the bus to Onsite Woodwork and go from there. limited! To reserve, a $250.00 sponsorship is required. 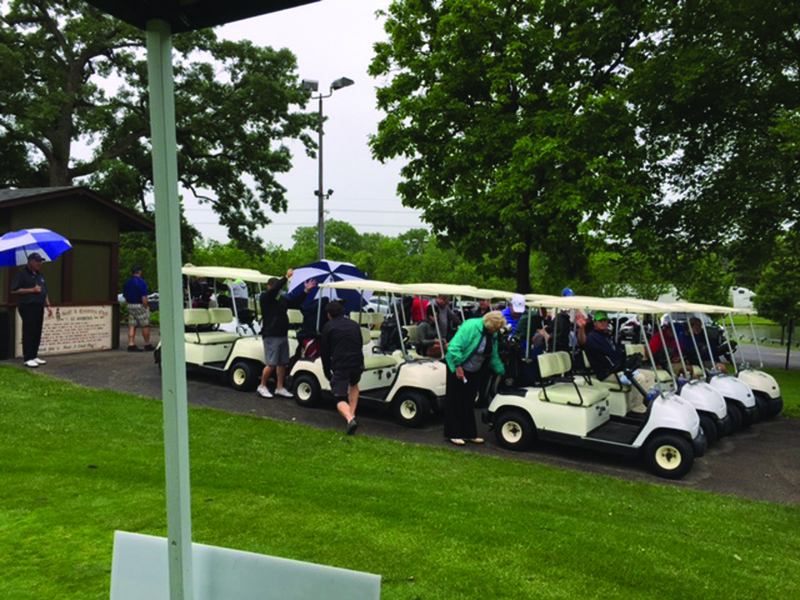 Golf, food, beverages, prizes and fun! Bring a customer, friend, prospective member or a deserving employee for a rejuvenating day on the golf course. 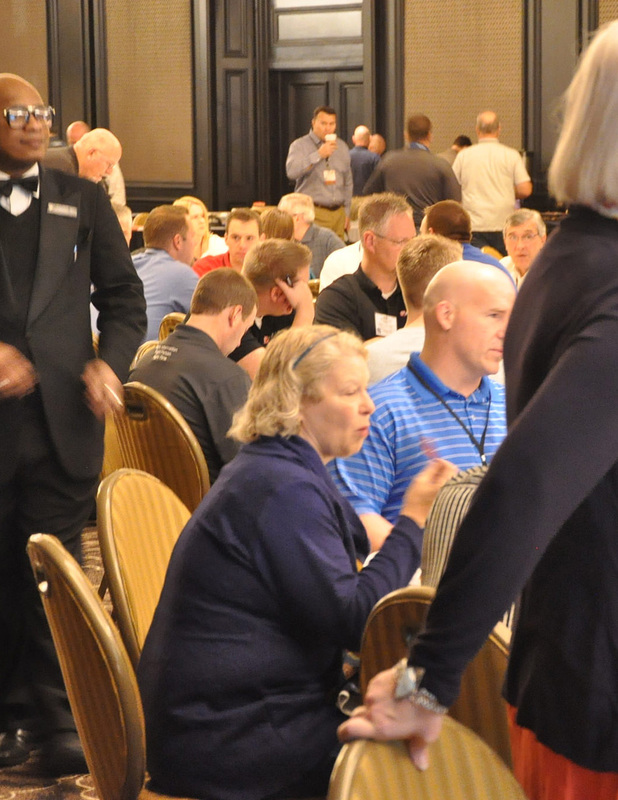 Cash bar and snacks will proceed lunch beginning at approximately 2PM. Golf package includes practice facilities with range balls, locker room and showers. Valuable prizes will be raffled off during lunch and this year's outing will feature a lucrative hole in one contest! 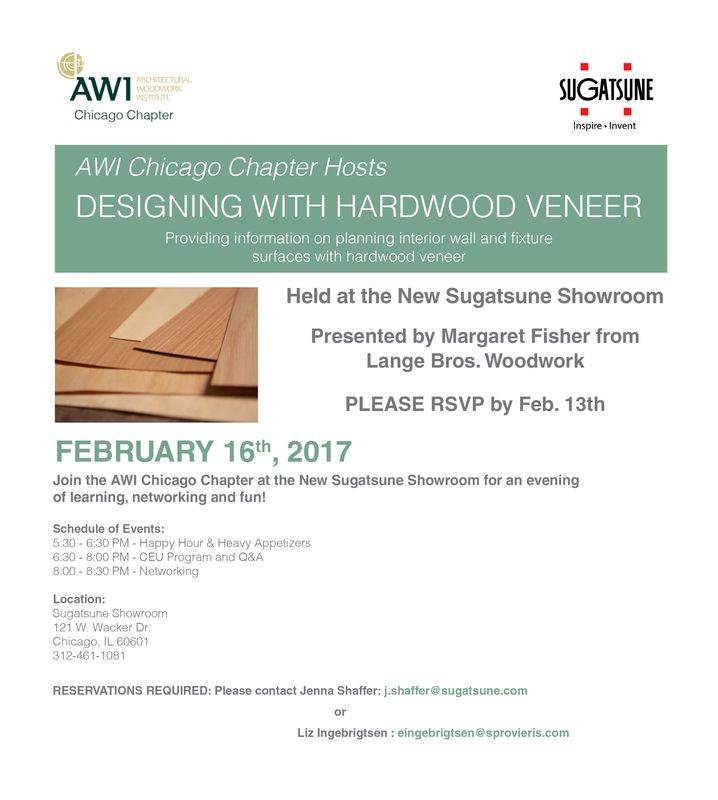 Join the AWI Chicago Chapter at the new Sugatsune Showroom for an evening of learning, networking and fun! Save the Date! 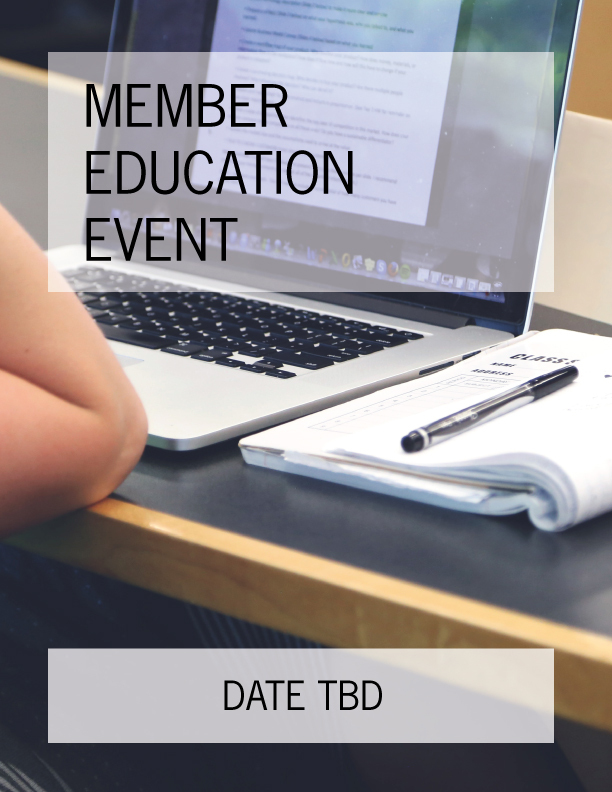 From Foundations to Future - we hope to see you there! Come celebrate with your fellow Chicago Chapter members as we close out 2017 in style. 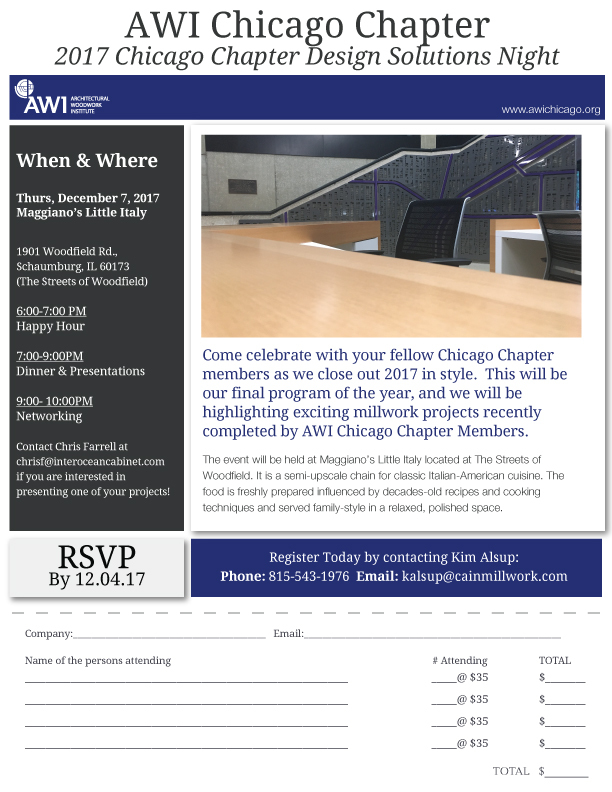 This will be our final program of the year, and we will be highlighting exciting millwork projects recently completed by AWI Chicago Chapter Members. If you pay online please email attendee names to kalsup@cainmillwork.com! 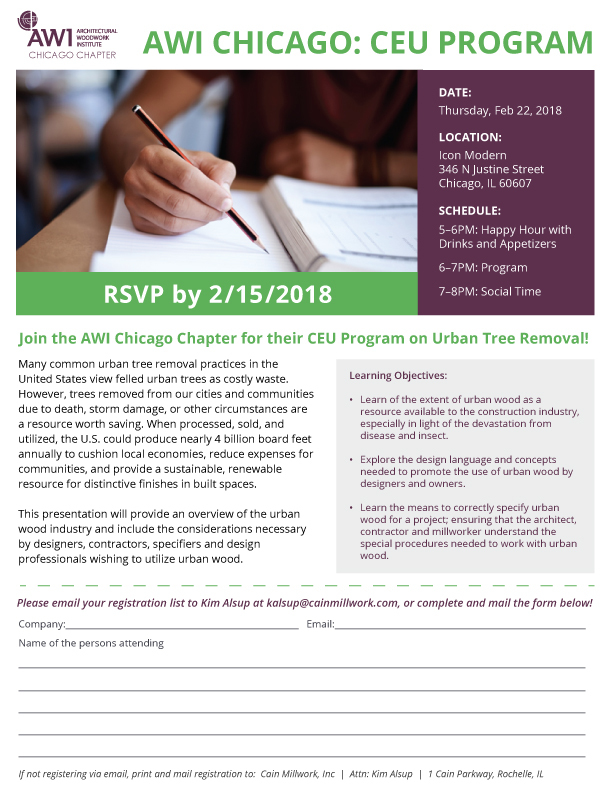 This presentation will provide an overview of the urban wood industry and include the considerations necessary by designers, contractors, specifiers and design professionals wishing to utilize urban wood. 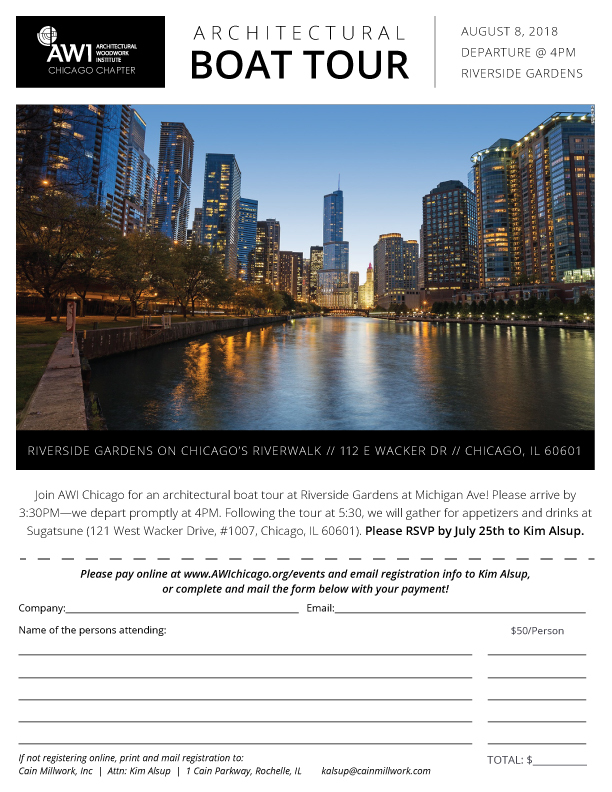 Join AWI Chicago for an architectural boat tour at Riverside Gardens at Michigan Ave! Following the tour, we will gather for appetizers and drinks at Sugatsune. 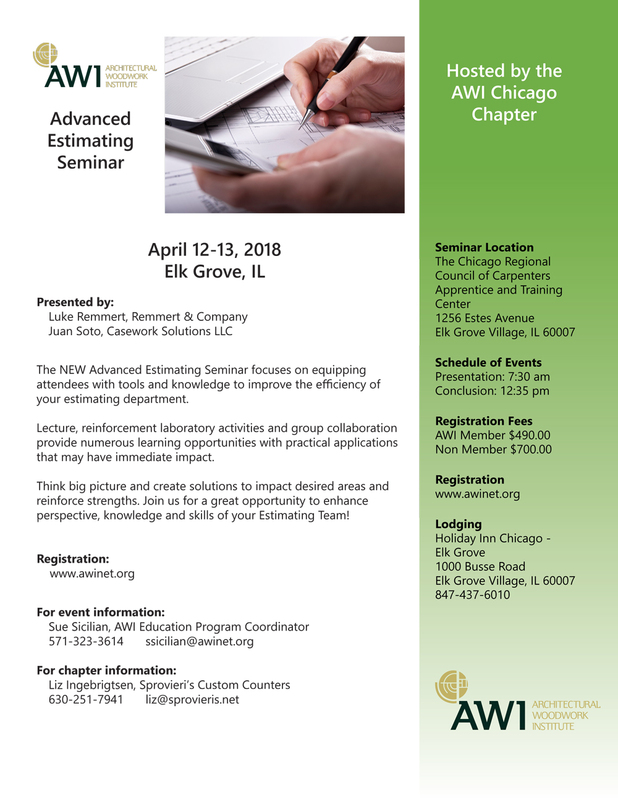 *IMPORTANT* Please email Kim Alsup your registration info when you pay online so we can match payment with contacts or be sure to mail your registration form along with payment to Cain Millwork, Inc | Attn: Kim Alsup | 1 Cain Parkway, Rochelle, IL! 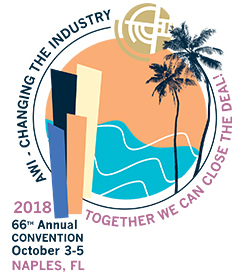 Save the date for the 66th Annual AWI National Convention. AWI is changing the industry – together we can close the deal! 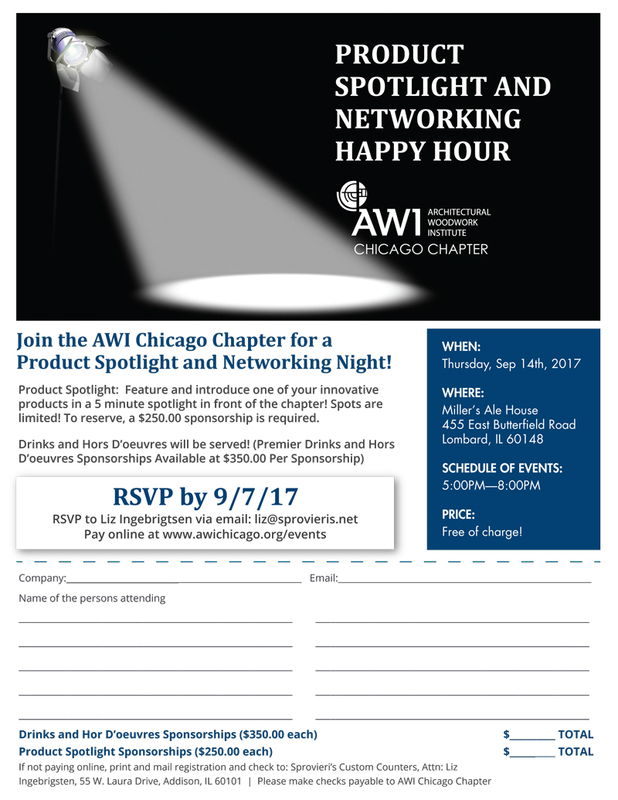 Take advantage of this opportunity to network, display your products and distribute handouts for your products and services! 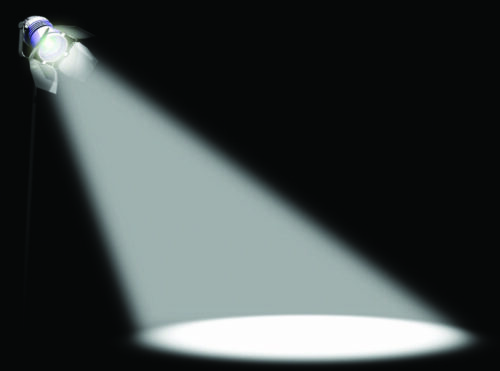 Please download and complete the PDF registration form and email it to pmcavoy@sierrafp.com. Then complete the online payment or mail in a check for the total amount. Thank you! 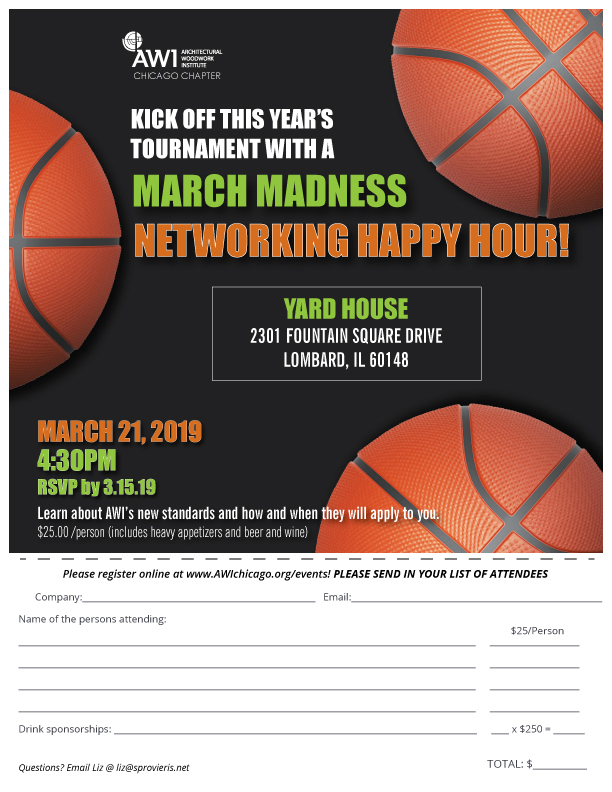 March Madness Networking Happy Hour! 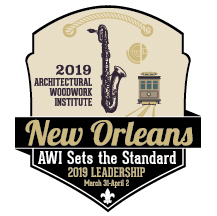 Learn about AWI’s new standards and how and when they will apply to you.